Sesame Street was an innovative and radical children's television program when it premiered in 1969. In the 1960s, many parents were concerned about the amount of violence and commercialism in children's television. Children were watching more and more television: according to some studies, preschool-aged children were watching 27 hours of TV per week. Critics began to study the correlation between television content and children's behavior. At the same time, educators began investigating broadcast media as a way to reach underserved audiences, especially young learners living in poverty who might not be as prepared for school as wealthier Americans. Using the colorful and fast-paced language of children's television to reach diverse communities with innovative new ideas about child development, Sesame Street sought to prepare toddlers for school and educate them to be tolerant, inquisitive citizens. The show became a cultural sensation that encouraged not only children but also adults to embrace diversity in a time of social conflict. The idea for Sesame Street traces back to a dinner party in 1966. Television producer Joan Ganz Cooney was hosting psychologist Lloyd N. Morrisett, an executive at the philanthropic Carnegie Corporation, when their conversation turned to children's television. Morrisett recalled that his three-year-old daughter would absorb some of the numerous advertising jingles that she heard on television commercials. He and Cooney wondered what could be achieved if all of the tools employed by television advertisers and performers were applied to education. With funding from Carnegie, the Ford Foundation, and the Department of Education, among others, Cooney and Morrisett established the Children's Television Workshop. They began to develop a groundbreaking new show. The program would air on the new Public Broadcasting Service (PBS) network, with funding from the Corporation for Public Broadcasting, allowing children and families across the country to watch the show without commercials. The mission of the show was to provide pre-kindergarten education to a diverse audience through memorable musical numbers, puppet performances, colorful cartoons, and deliberate representation of America's multicultural population. 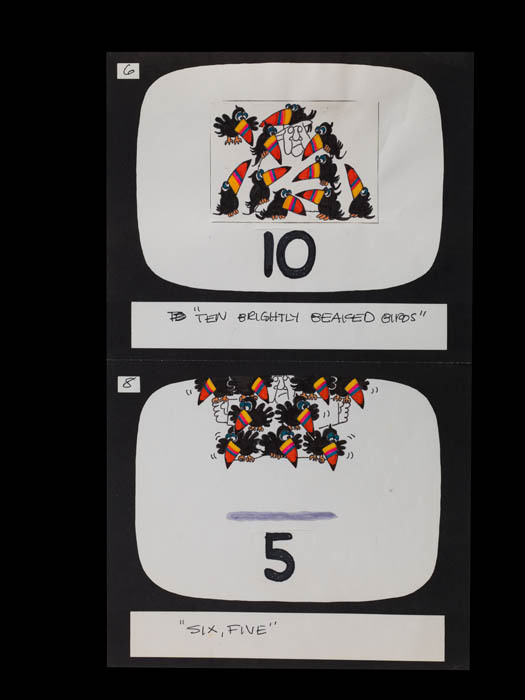 In 2018 the museum is exploring this connection between philanthropy and children's television history in the "Culture and the Arts" section of Giving in America. 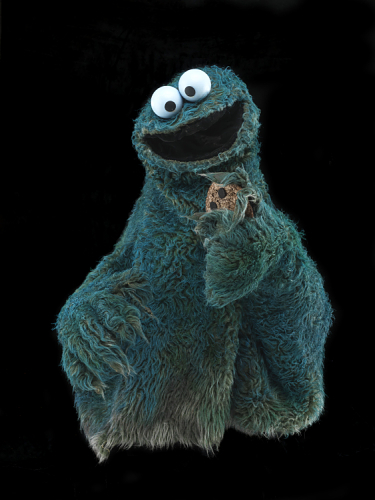 The original Cookie Monster puppet created in 1969 for "Sesame Street"
One of the show's writers, Jon Stone, suggested Jim Henson create the puppets. Although he never wanted to be identified as a children's entertainer, Henson decided to become part of the project. He embraced the idea of supporting underserved children. Henson's puppets helped display a diversity of personalities in a neighborhood that teaches how people care about each other. Every puppet was created with the purpose of representing different roles and attitudes. For instance, Elmo is meant to have the psychological age of three-and-a-half. What would the new program be called? The show's working title, 1-2-3 Avenue B, was deemed too New York-centric for a show intended for audiences across the United States. Hundreds of title ideas were considered. At the last minute, Executive Producer Dave Connell distributed a memo stating, "If nobody came up with a better idea, as of Monday we were going to call it Sesame Street." 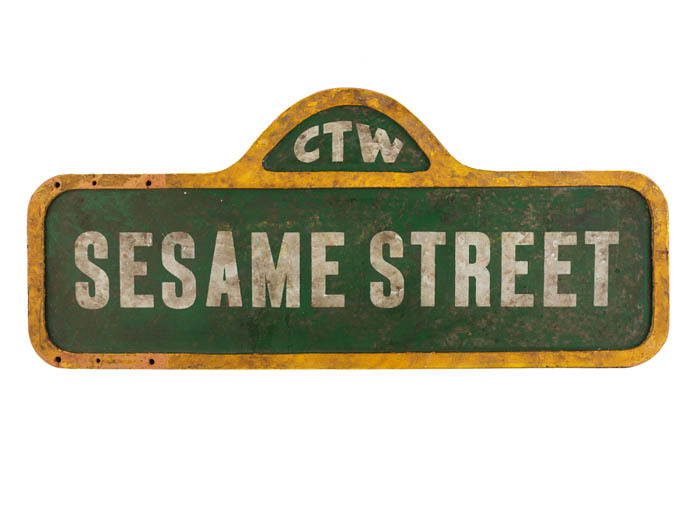 The iconic "Sesame Street" sign joined the museum's collection in 1979. Almost 50 years later, Sesame Street continues to educate children around the world. Now, there is a Sesame Street in more than 150 countries. Through Sesame Workshop, children from a variety of family types and environments are able to learn about culture, diversity, and other important values. Gabriela Sama is a curatorial intern in the Division of the Culture and the Arts. Giving in America is part of the museum's Philanthropy Initiative made possible through the support of the Bill & Melinda Gates Foundation and David M. Rubenstein, with additional support by the Fidelity Charitable Trustees' Initiative, a grantmaking program of Fidelity Charitable.